Are your sites up to date? It is very important that they are. Find out why! Many of us run websites using pre-made scripts such as WordPress, Joomla, or Xenforo. Far too often people forget to keep these scripts up-to-date. In other cases, they choose not to upgrade as they feel updating can be difficult. Whatever your situation, please take a moment to ensure all of the scripts (including themes, plugins, mods, and so on) are fully up to date. Check right now – I’ll wait. If anything isn’t up to date, it’s a good time to start planning on doing those updates. If you already know what you’re doing, you have good backups, and the risks of updating are low, do the updates as soon as possible. So why are updates important? Security! 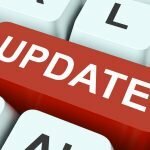 While it is true that updates usually include new features, there are a lot of updates that include security patches to close security holes in the core software, themes, or plugins. This can help keep your site safer by preventing the hackers from exploiting these security holes to deface or modify your site, to send spam, or from distributing malware via your site! Hackers like to take advantage of known issues that haven’t been fixed on outdated sites and we see thousands of scans for this every day. New features. Sometimes updates have new features. This is one of the main reasons that users do update their software for. Regardless of whether new features are released or not you should in almost every situation be running the latest version of the software available. Compatibility. New versions of PHP, MySQL, MariaDB, and other technologies that are used to power your sites are released on a very regular basis. If you do not keep your site up-to-date it is possible that you will become so outdated that your site is no longer compatible with the software on the server that powers it. This is compounded when updating from such an old version can have unexpected complications. Ease of updating. This might seem redundant, but the further out of date you are, the harder it might be to upgrade in the future. Are there risks to updating my scripts? There can be some risks and it is always suggested that you generate a full backup of the site or otherwise back up the files and the database(s) prior to upgrading. It depends a lot the script you are using and any customizations you may have performed. Some scripts like WordPress make updating easy, but nothing is 100% foolproof. Ensure you have good and recent backups of everything you need to get the site back online if anything goes wrong. This includes not only the files but the database(s) as well. For critical sites it is suggested that you perform updates during your off-peak time to minimize risk. For sites with a lot of user generated content, such as busy forums or e-commerce sites, see if you can switch the site into maintenance mode right just prior to performing the update. This will alert visitors to what is happening and prevents new content from being added, which could be lost during the update process if something goes wrong. Check the sites theme, content, and general functionality after the update to ensure it looks and works like you expect. If you are an MDDHosting customer you can reach out to support and we’ll do our best to help you. If you aren’t a customer do please feel free to comment on this post with any questions you may have!